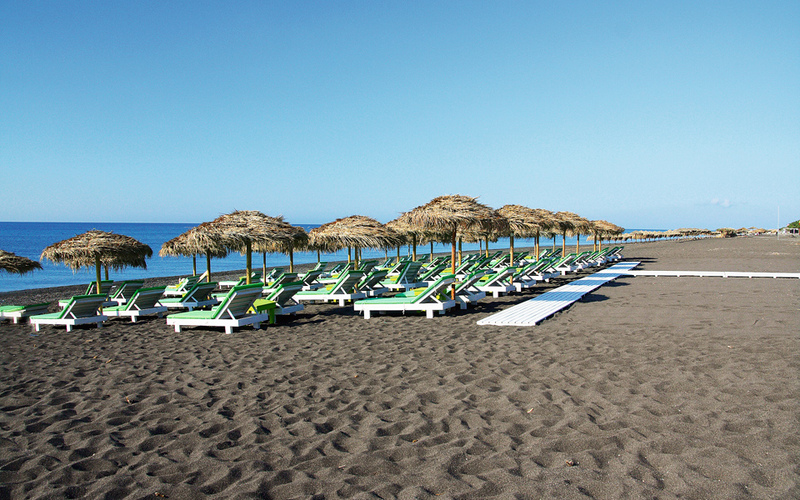 Tourist hot spot with watersports, fine black sand and deep waters. Awarded a Blue Flag this year and others, busy, with all kinds of stores along the coastal road, which becomes pedestrian-only in summer. 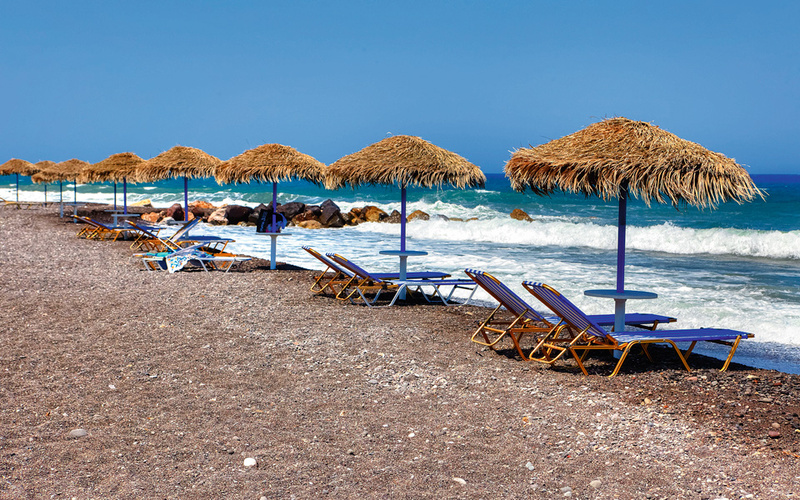 A continuation of Perissa, also with black sand, as well as inviting waters and plenty of options for sporting activities, food and fun. Cosmopolitan and trendy. A remote sandy beach lapped by warm waters thanks to the nearby underwater volcanic crater at a depth of 512 m., which last erupted in 1650. Accessible only by vehicle. Bring your own water and supplies. 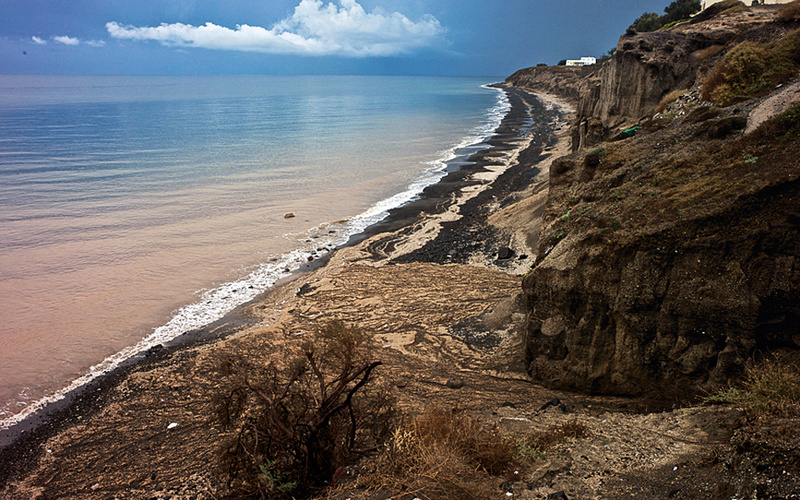 A quiet beach with black volcanic sand and small pebbles. One of Oia’s most popular spots, particularly with families, thanks to its shallow waters. It is also preferred by surfers when the winds are northerly. Access by car or motorbike. 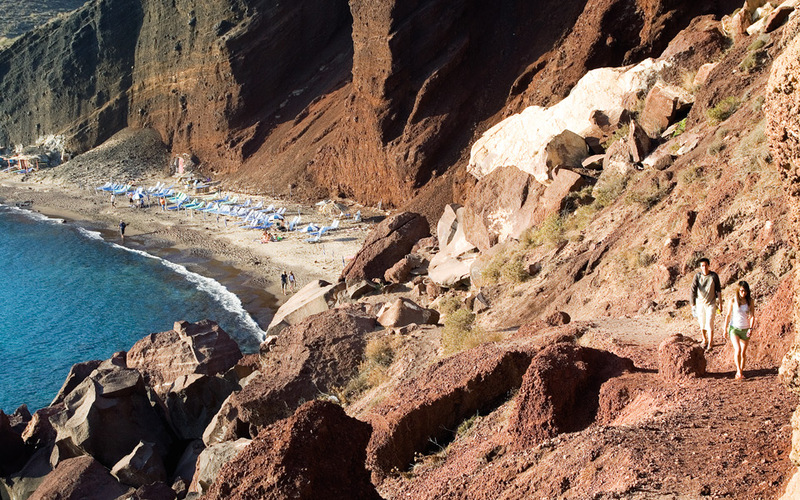 If, on the other hand, you prefer to follow the locals to their favorite places for a swim, then head north in the direction of Oia, to Koloumbo with its warm waters, Pori for peace and quiet, or Baxedes for black sand, shallow waters and surfing (when the north wind is blowing). Then again, you may be more of an explorer-hermit who wants to feel that the sea is all yours. If so, the ideal solution would be to rent a yacht (read: The Perfect Sailing Getaway). 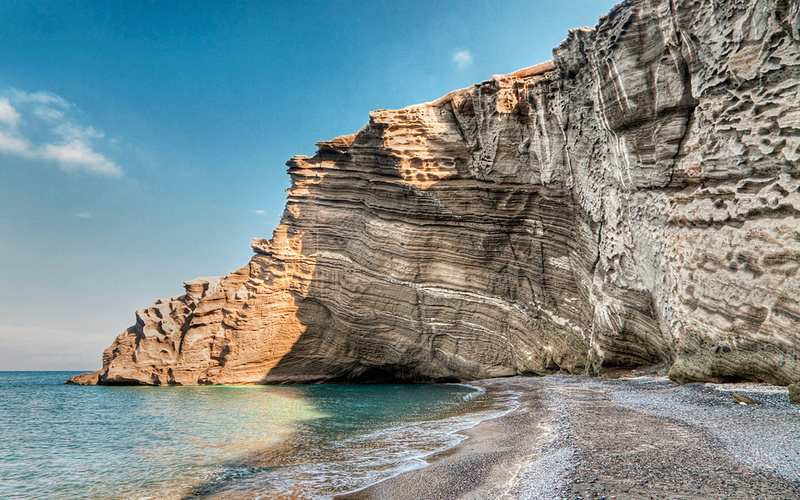 Mesa PIigadia (south-west): Miniature version of the famous Vlychada, with small white pebbles and impressive rock formations, which the local fishermen have excavated into shelters for their boats, behind painted wooden doors. Accessible on foot or by boat. A good choice for a relaxing swim when the north winds are blowing. Pori (north-east): A small, secluded beach with dark sand and, more recently, a small fishing harbor, located further along the coast to the south of Koloumbo. The locals love it because it’s quiet and undisturbed. There are also a couple of nice fish tavernas. Vlychada (south): Easy to reach, quite large and with a striking setting. One part is equipped with loungers and has an excellent beach bar, Theros, tel (+30) 6977.222.666, but there is also plenty of space to spread your towel or strip off far from prying eyes. Monolithos (east): A long stretch of sand with shallow waters, a playground and other sports facilities, plus a lifeguard, making it ideal for families. You will find a selection of restaurants and tavernas, along with changing facilities, showers and public restrooms. Perissa (south-east): One of the first seaside areas to feel the tourism boom, a magnet for the young crowd, offering plenty of facilities (accommodation, camping, beach umbrellas, restaurants, bars, watersports, diving center). Blue Flag recipient, with fine black sand. White Beach (south-west): If you do get as far as Red Beach, it is worth paying a visit to its neighbor, a small cove surrounded by high rocks that overlook the beach of black, gray and white sand with large pebbles. There are only a few loungers and umbrellas. You can reach it by caique from the beach to the right of the Akrotiri archaeological site (a short and pleasant boat ride) or on foot (on the road to Faros, follow the sign left to “Kambia” and from there take the footpath).